A leisure level ride on a paved road. Staying at the Kirkwood Village and want to take a leisurely cruise? 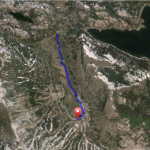 You can ride out along the Kirkwood Meadow Drive to the historic Kirkwood Inn. 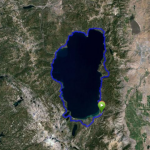 We wish we could suggest riding to the dam at Caples Lake, just an 1/8 mile away, but there are no shoulders on the road and in its present condition just too risky to suggest. However, if you are experienced road cyclists comfortable sharing the road with vehicles then this could be an option for you. Not advised for small children. Kirkwood is named after Zachary Kirkwood, who moved here from Ohio to establish a cattle ranch in 1860 and take advantage of lush meadows to raise cattle. In 1864, he built and opened Kirkwood Station – an inn, post office and restaurant. Interestingly, the building is literally built on the junction of three California county lines: Amador, El Dorado and Alpine. The bar was built on wheels so when the tax collector from a particular county arrived to collect revenues, the inn keeper would move the bar into another section of the room that was in a different county to avoid paying the collector.